On the picture Rudi Caracciola seems a very pleased man and he had all reason to be. At Tripoli he was finally back on top after two years of pain and agony. When Michael Schumacher went into the tyre barrier in Silverstone, destroying both his leg and his GP season, he hardly was aware that a similar thing had happened to a fellow countryman 66 years earlier. By 1933 Rudi Caracciola was one of the top drivers in the world. He was a triple winner of the German GP and had as the only foreigner managed to win the Mille Miglia, a feat that only Stirling Moss ever managed to repeat. German born with an Italian name (his ancestors came from Sicily) Caracciola had been works driver for Mercedes-Benz since the early 20s, first as junior but later as their head driver racing their heavy 7-litre SS, SSK and SSKL cars. His driving style was very calm with perfect driving control and it was during bad conditions that his driving abilities came to its best. To the Germans he was known as "Der Regenmeister", the rain champion. By 1932 however Mercedes-Benz had decided to withdraw from motor racing. In Germany the economic crisis was at its worst, the SSKL cars were outdated and there was no hope of building anything new, so Mercedes-Benz had to release Caracciola with a verbal assurance that he would return to the team when better times came. After a year as works driver for Alfa Romeo Caracciola decided to become a privateer. Together with his friend Louis Chiron he bought two Alfa Romeo Monzas and created the Scuderia CC. The first race for the new team was at Monaco on 20-23 April 1933 and after having done 25 practice laps Caracciola's brakes suddenly failed while he was coming down from the chicane to the Tabac curve. Caracciola had to choose between the water and the wall and selected the latter. At first the damage seemed to have been restricted to bent metal and Caracciola rose to indicate that he was unhurt. But suddenly his legs failed and he collapsed. Caracciola was carried on a chair into the tobacco shop where the owner tried to console him: "Make yourself comfortable, the ambulance will soon be here. We have a very fine hospital here at Monaco, lots of famous people have died there." 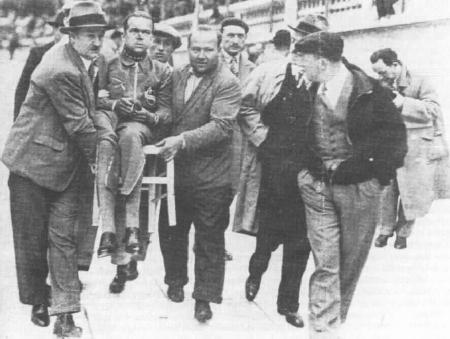 In the hospital Caracciola, who was afraid that the leg would become stiff, refused to be operated but the doctors had already come to the conclusion that Caracciola's racing career was over whether he was operated or not. The right thighbone had been crushed where it joins the hip. Caracciola was transfered to a private clinic where he spent half a year with his lower body in plaster before the slow and painful exercises trying to walk with crutches started. Day and night his wife Charly stood by his side until he persuaded her to have a day off to go skiing. Then a new catastrophe took place. Charly was surprised by an avalanche and was found dead. Rudi fell into a state of deep depression. Rudi's friend Chiron and his girlfriend Alice Hoffmann took over where Charly had left off and finally managed to bring Caracciola back on his feet again. One year after his crash he was back at the wheel doing a slow lap of honour at Monaco before the race. 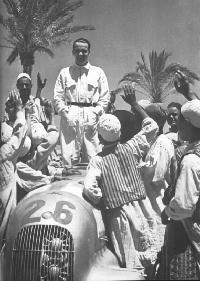 Mercedes-Benz was back in racing 1934 and Caracciola was signed on as driver but he was a total question mark. His right foot was shorter than the left and he walked with a stick. After some practice runs at Avus in great pain he made his comeback to racing at the French GP in July 1934 and showed before retiring that at least the speed was still there. He managed to take the lead in both the German GP and the Coppa Acerbo before having to retire in both races. Caracciola's first victory came in the Klaußenpaßrennen mountainclimb in Switzerland. On such a short sprint with only 22 kms distance to cover he was able to stand the pain from the leg. Caracciola also won the Italian Grand Prix but it was a shared drive. At half distance Caracciola could no longer stand the pain and had to give over the car to Fagioli, who went on to win. For the 1935 season Mercedes-Benz bettered their W25 cars with a new gearbox design and built a new chassis so that the team had two alternating sets of cars, each set consisting of 3 cars plus a spare. The senior drivers had the new enlarged 3.7 litre B type engine. The first race of the year was Monaco where Caracciola retired and then came Tripoli. Libya had been an Italian protectorate since 1912. Governor was Marshal Balbo and he had connected the Grand Prix to a state lottery. Thereby he made the Tripoli GP into one of the most money filled racing events in the world. The ultra fast Mellaha track situated around a salt lake in the desert had also got its share of the money and was fully modern with the latest equipment and facilities and a grandstand second to none. Mercedes entered three cars for Caracciola, Fagioli and von Brauchitsch. To hinder sand and foreign objects to enter the supercharger the cars were fitted with a new air cleaner. As can be seen on the picture it consisted of two conical inlets surrounded by angled blades that deflected incoming particles into a collector and released them through a vent under the car. There were fears that the tyres would not stand the hot high-speed track. The main rivals were the Auto Union cars of Varzi and Stuck, and Nuvolari who raced Alfa Romeo's giant 6.3 litre "bimotore" as the race was run to the free formula. Mercedes team manager Neubauer expected that Auto Union would try to make the race in two stops and calculated that with a three stop strategy Mercedes had to be 2.5 seconds faster per lap. The 40-lap race started off badly for Mercedes as von Brauchitsch was an early retirement and Caracciola had to come in after only five laps with a front wheel puncture. He made a new stop for rear tyres on lap 8 and was now down to a seemingly hopeless 10th position. But the other drivers had their fair share of tyre problems too and despite having a third stop on lap 16 Caracciola had reached fourth position at half race distance. At lap 27 Caracciola made his fourth and final pit stop but the pace of Caracciola's driving had been such that he sometimes had been as much as 10 seconds faster per lap as the leaders. 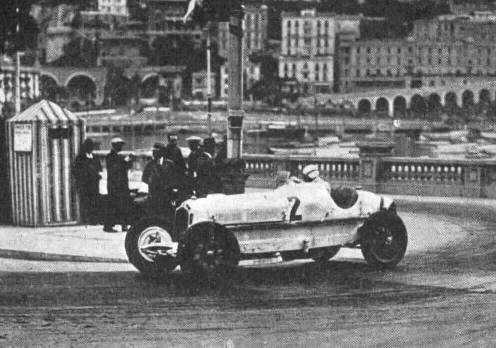 So with a quarter distance to go he found himself in third position behind Varzi and Nuvolari. Now Caracciola was helped by the old rivalry between the two Italians. Without caring for their tyres the Auto Union and the Alfa raced side by side with neither of them willing to give the other any advantage. As expected Nuvolari soon had to make a pitstop and when Varzi also made a stop and remained in the pits with a jammed hub Caracciola took over the lead. Coming out of the pits Varzi took up the chase only to have a puncture on the last lap, just as he had reached the Mercedes. Caracciola could celebrate his first real victory since the crash. Even more importantly, the pain in the leg had been tolerable - thirst had actually been a greater problem during the race. This turned out to be the first victory of six in a fantastic season that earned Caracciola his first European championship. He would become champion again in 1937 and 1938 before the war stopped all racing. A post-war comeback was interrupted by a crash at Indianapolis followed by another one at Berne, the latter one breaking his left leg and finally ending his career. A full description of the 1935 Tripoli GP can be found here. Rudolf Caracciola participated in the Lotteria di Tripoli many times and won it in 1935 with the Mercedes W25B 3.7 litre Daimler Benz #26. The Lotteria di Tripoli was a race but a lottery as well. A single bet would cost you as much as 12 lire with prices totalling a stunning 36 million lire. A vast amount in those days. The winner would receive about six million lire. The lottery was based on the starting numbers of the cars that participated. So sitting next to the radio on raceday was not only done by real tifosis during the Tripolis race. For this lottery a lot of cars were attracted (required for the lottery itself) with a high amount of price money. Caracciola also took part in this ninth Gran Premio di Tripoli, a Grand Prix of 40 laps totalling 525 km. The Tripoli Grand Prix was a Formula Libre race and was held at the Autodromo di Mellaha circuit (13.14 km), a fast road circuit. Caracciola was one of the three Mercedes drivers with a competition of two Auto Unions and six cars of the Scuderia Ferrari (two Bi-Motore's posing the real threat). In practice Caracciola was third fastest behind Stuck (AU) and Nuvolari (AR). But being a special event the starting grid wasn't made up by practice times but was a lottery as well. Caracciola had 'received' a position on the outside of the third row of the grid (position 13, hence #26=2x13). At the start he was well away and 'jumped' into the lead with Italians Nuvolari and Varzi chasing him. After a few laps Varzi had overtaken Nuvolari and chased the German. The Bi-Motore was experiencing high tyre wear but also a high fuel consumption. A few laps later Caracciola heard a strange noise in front of him and quickly found out it was a front tyre puncture. He quickly returned to the pits to change this tyre. In the pit there was panic in the Mercedes pit. Actually Neubauer had been planning for a three-stop tactic, but this was somewhat early in the race. After twenty seconds Caracciola left his crew and a franticly shouting Neubauer. Varzi now led the race with team mate Stuck in second. A few laps later Caracciola had to pit once again, this time a planned stop for fresh rear tyres. He was now one lap down in 10th position. A third pitstop before half time pratically put "Karratsch" out of the race. But the heat and all other extreme circumstances were there for the competition as well. On lap 20 Caracciola was in fourth again and on the same lap as the race leader: Varzi. A final pitstop was made by Caracciola and steady on he climbed into second. The speed differentials of some cars must have been tremendous. Caracciola once described how the slower Maseratis and Alfas would appear from the dust with his Mercedes nearly at flying speed (over 300 km/h), one had to pay close attention, all race long. Nuvolari made a fierce attack on Varzi after overtaking the two Mercedes. A clash of the titans unfolded. But a necessary pitstop threw Nuvola back. Now Varzi had problems, his tyres needed replacement after his battle with the Alfa. One long lap he had to limp back to the second pit. Caracciola now took the lead with only 5 laps left. Varzi returned to chase the German and managed to reach the Mercedes. With his devilish look Varzi nearly punted the German down as the Mercedes driver could clearly see Varzi in his rear view mirrors. Only a tyre blow took the victory away from the Italian, leaving the German with victory, his first of the season and certainly one of his finest. It was his return to the front line of GP racing. The race results made a poor man from Rome a millionaire. He won after Caracciola's win. He was lucky not to have ripped his ticket in two at mid-distance when "Karratsch" looked to have no chance at all.